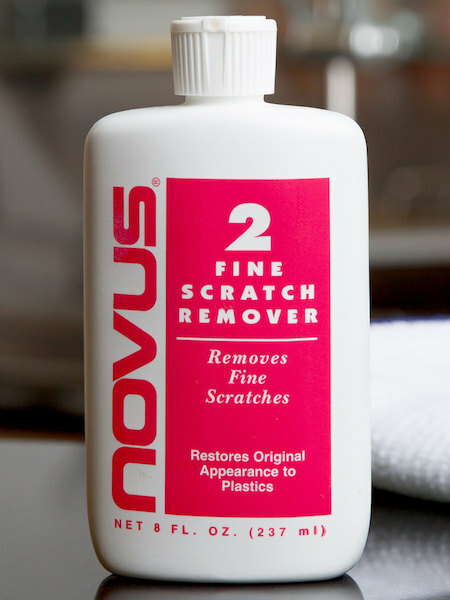 Novus plastic fine scratch remover as its name suggests removes fine scratches and abrasions from most plastics. NOVUS plastic fine scratch remover, is the answer when it comes to scratch removal and long lasting protection of acrylic, plastic and fiberglass. For home or industrial use in restoring scratched, faded or discoloured plastics. Inspect the condition of the surface to be treated. The deeper the scratches, the greater the pressure required to remove them. If the surface is dirty, clean with warm soapy water before applying NOVUS. Apply NOVUS liberally. Using a clean, soft cloth, polish with a firm back-and-forth motion at right angles to the scratches. Keep the cloth saturated with polish at all times. When the worst scratches have been polished out, reapply NOVUS uniformly in a circular motion to the entire surface using short, circular strokes and light pressure. Allow to dry to a light haze. For heavy scratches, multiple applications of NOVUS may be required.